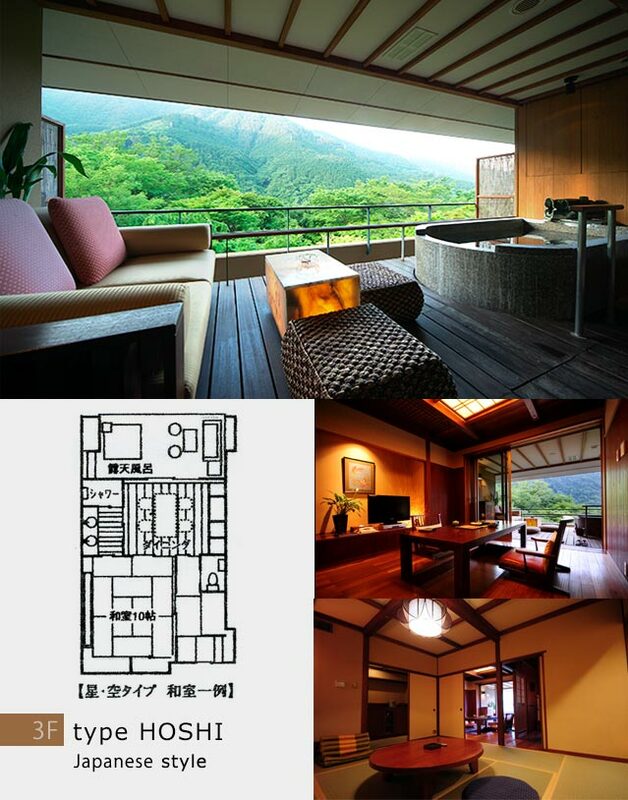 This wonderful place filled with peace and tranquility is located in grand Hakone mountain range and Hayakawa ravine, where every season is enjoyed with splendid color scheme. 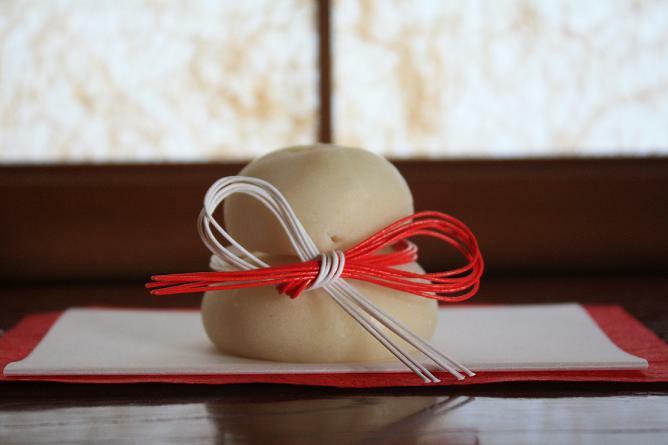 Hakone ginyuu entertains a customer with the service to which I gave my whole mind while making the custom of the Japan ancient times where I live and the traditional event as well as the naturalness important. 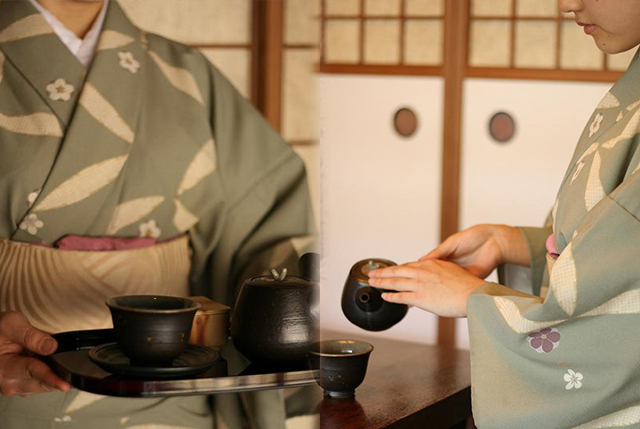 We'll serve you with Japanese green tea as a welcome drink upon your arrival. Please also enjoy delicious Japanese confectionery together. You will find a yukata in the guest room. 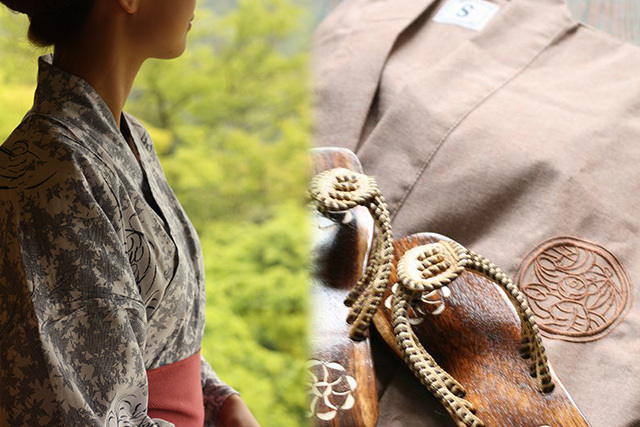 Yukata is a kimono-style sleepwear. You can also wear this to the public bath or to the public eating area. Inside of the building is a tatami-floored to the hallway. Please take off footwear and relax slowly. 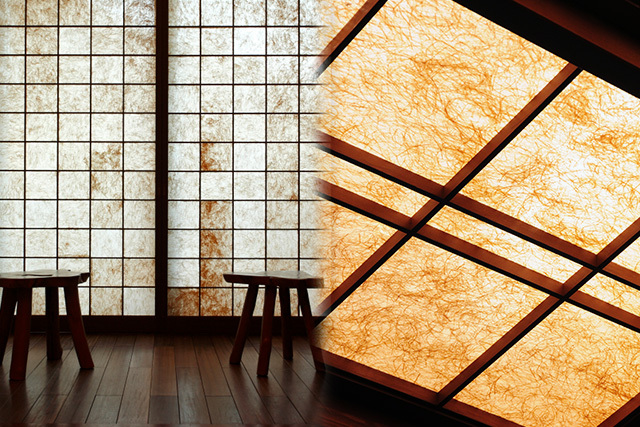 Teruaki using Japanese paper and a natural stone begins to create gentle and mysterious space. It is an original product that blended high-quality ingredients luxuriously. We are working on development while incorporating customer's voice. We manufacture in Japan aiming for safety and security. Also, we try to produce small quantities to keep freshness. 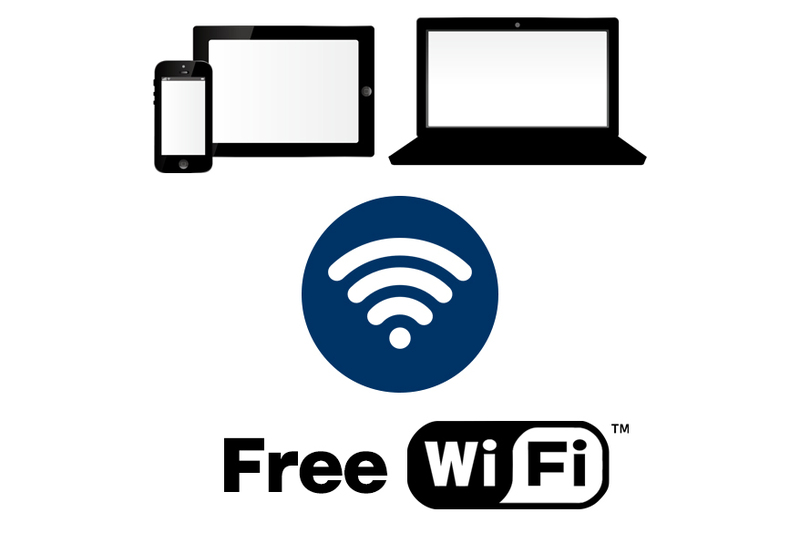 Wireless internet is available in the hotel. Wired internet is available in certain guest rooms. About 420 m of altitude. 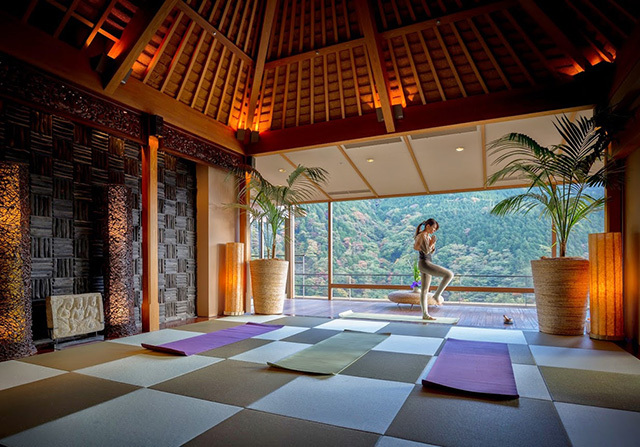 A view in the grand Hakone mountain range where four seasons are interwoven is spread in immediateness from a front door and a lobby located in the top floor. Hayakawa called a bed of a dragon flow under the eyes, and wrap yourself up in mysterious air, it's done. 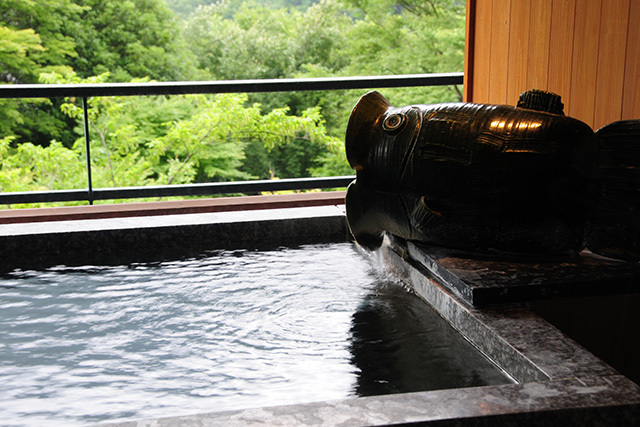 Hakone The source which gushes from Miyanoshita in Kumanojinja in Muromachi era was found, and Miyanoshita hot spring prospered as a therapeutic bath in the Edo Period. And after Yokohama had been opened up in the 19th century (the Edo Period latter period-Meiji Period), a celebrity of all over the world prospered as foreigner's health resort, and visited. 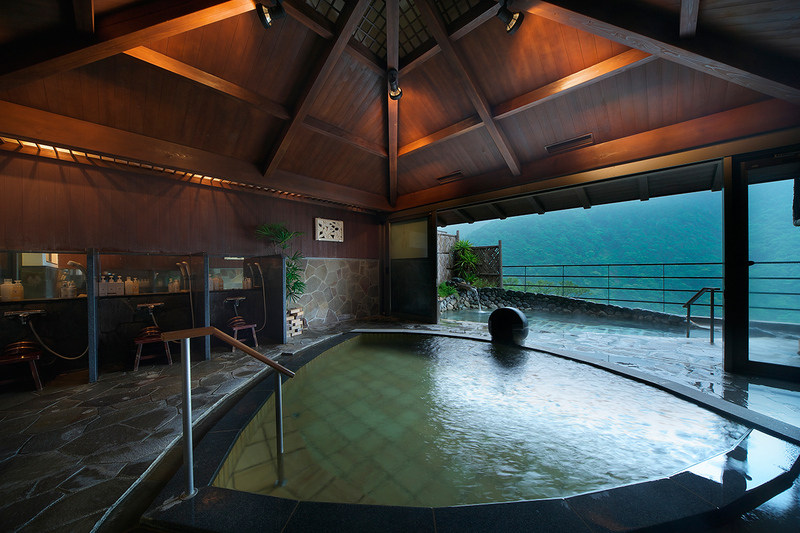 I have the outdoor hotspring bath which sees a grand Hakone mountain range in all guest rooms. Please enjoy bathing slowly while looking at the beautiful scenery different in an appearance respectively. 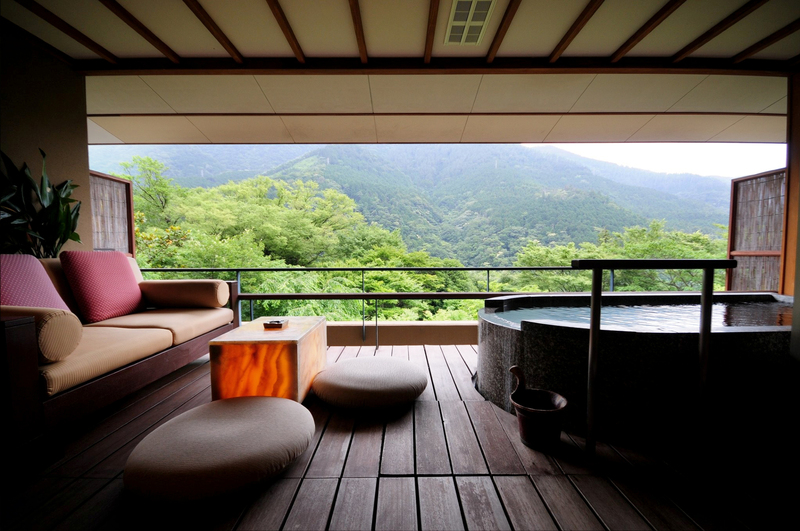 Hakone mountain range is seen over the horizon, and it feels like becoming united with immediate nature, and you can take a bath and there are 2 hot water places. 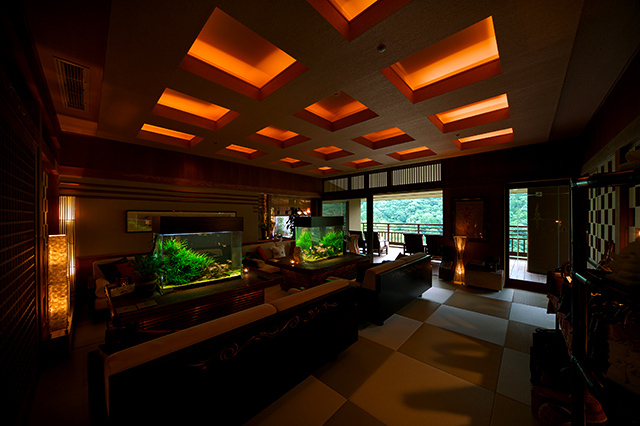 Both hot water places are equipped with an outdoor hotspring bath and a sauna. The men's section of a bathhouse and the ladies' section of a bathhouse are replaced by time, so both baths can be enjoyed. 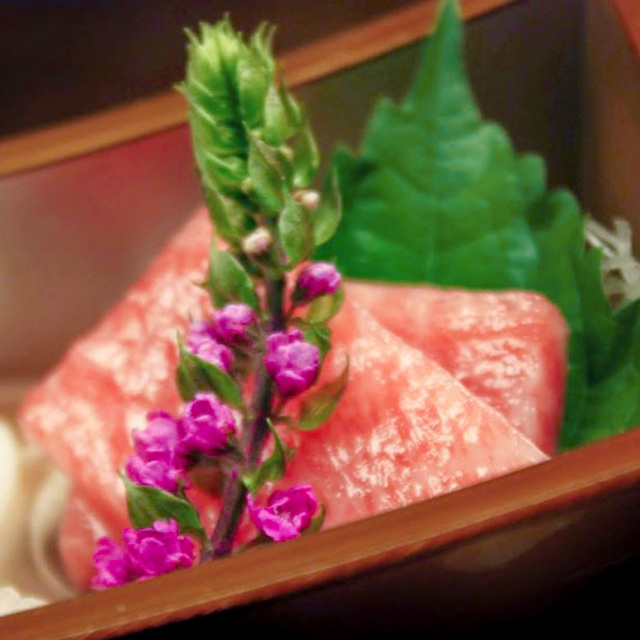 In Japan where a producer bet the place fish which can have just been caught, the domestic Japanese Cattle "Soshuu cow" and the Kamakura vegetables fried at Sagami-wan on great care, I have a large selection of the outstanding brand ingredients. I'll offer you the treatment which can be sensed only here while relating to nature on the concept of beauties of nature. The original product which blended an ingredient excellent in quality luxuriously is being used for a treatment. 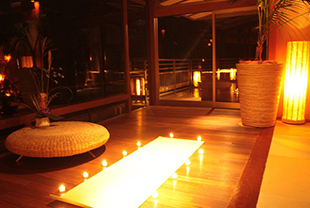 The five senses are healed by the synergistic effect with the hot spring. 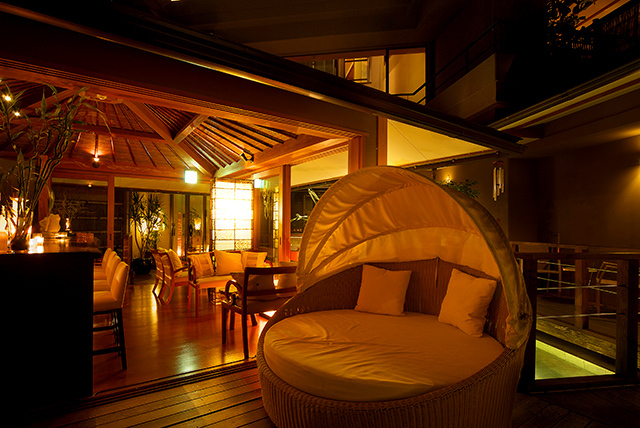 Please have the coffee by which the top floor tastes good while looking at the beautiful scenery by Lounge GINYUSHIJIN. 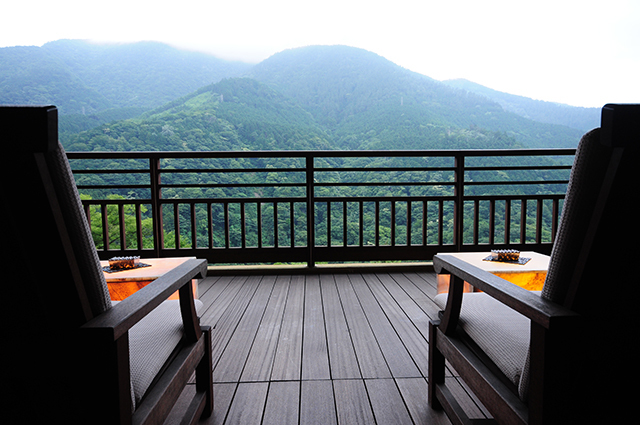 A panoramic view in a grand Hakone mountain range spreads in front of the superb view terrace. A beautiful view can be enjoyed over glass while also drinking liquor from this view bar counter. 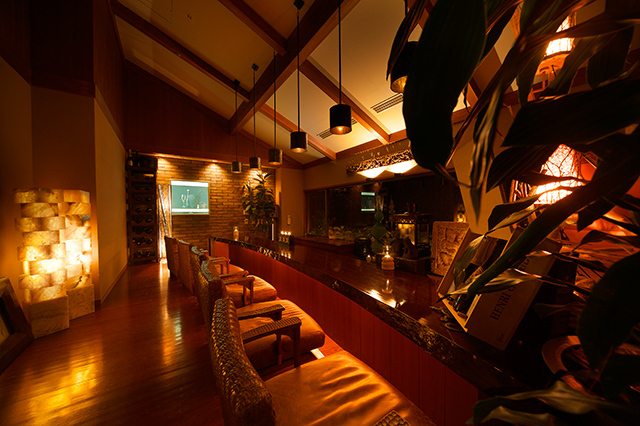 A garden lounge on the 1st floor is the open space which floated on a pond.You can trust GAZEBO with a body and spend time of the paradise while drinking good liquor. 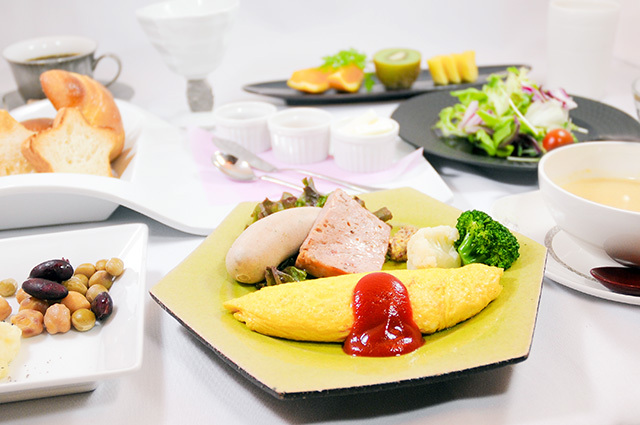 It's offered to dinner and breakfast and others in the guest room, but a dining room is being arranged so that to offer a meal without passing the bedroom, so even if outfitting can't be arranged, it's OK.Please enjoy a dish without hesitation for everyone. The wind type is only 1 guest room in floor 4F. 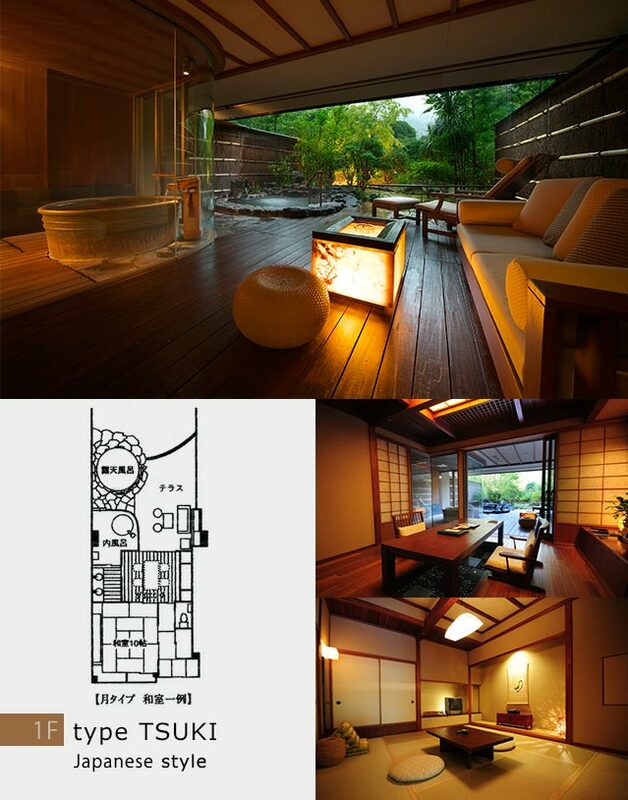 I have an outdoor hotspring bath and a bath in an open terrace. 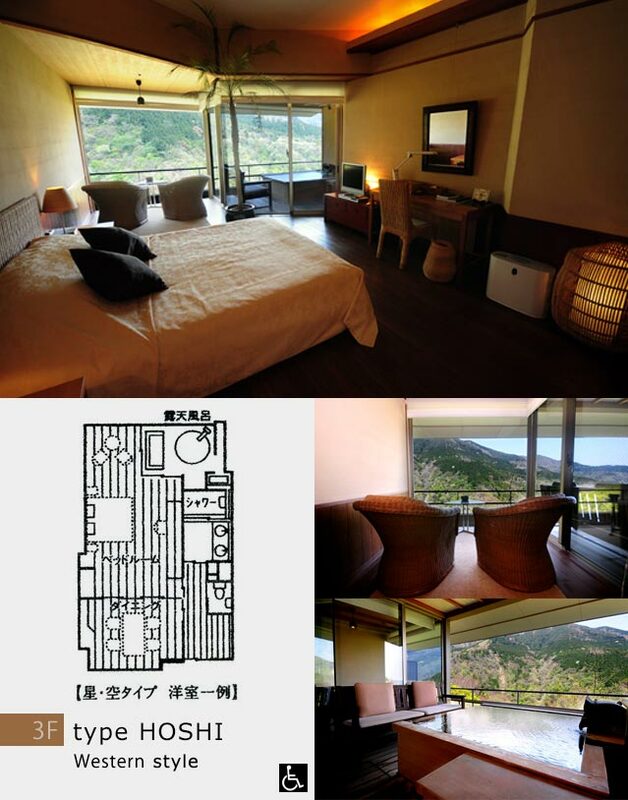 You can wish for a superb view in Hakone mountain range from a Open-air bath and a view living room. The stellar type 3 F, there is a maisonette in 4F part. You can see a living room of a wellhole with feeling of opening and the scenery as if it's necessary for heaven from 4F. 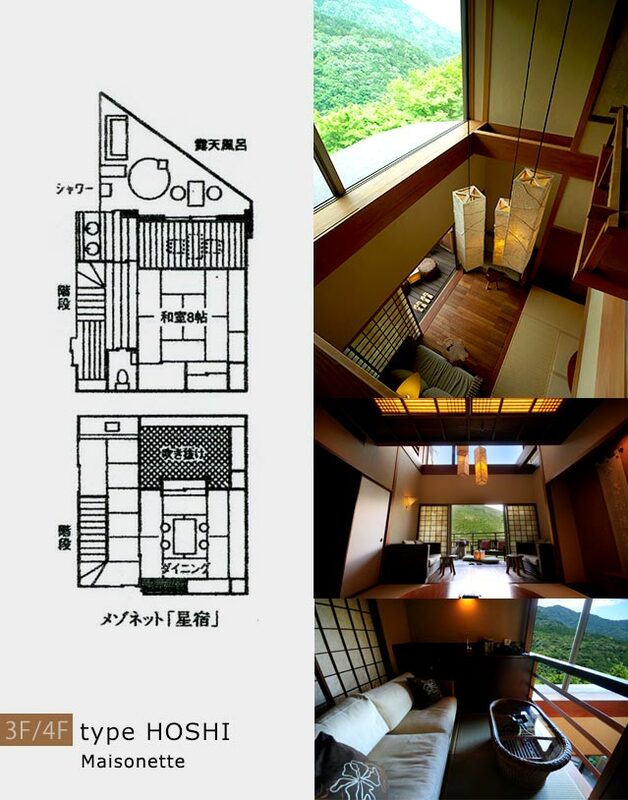 There is a「type HOSHI」in 3F.A superb view in a grand Hakone mountain range is spread in immediateness. 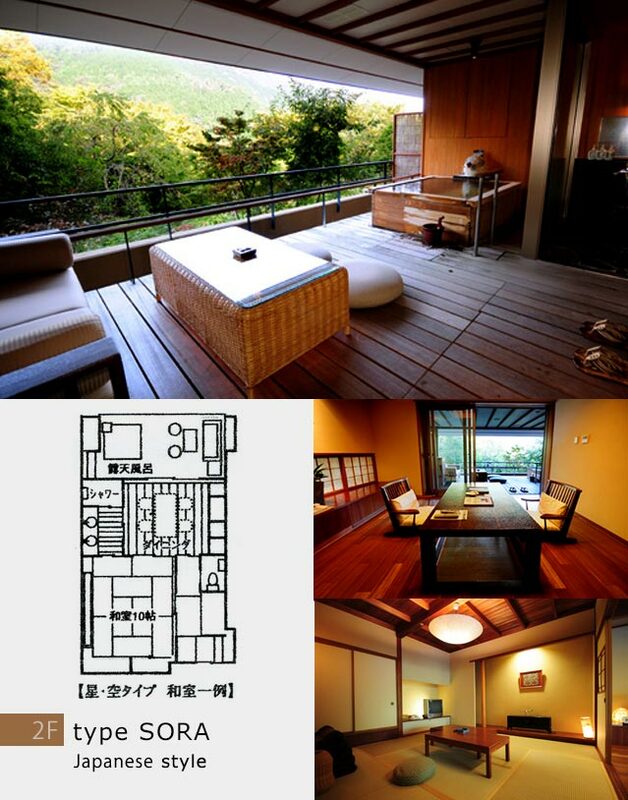 The Japanese-style room type or the Western-style room type can be chosen. 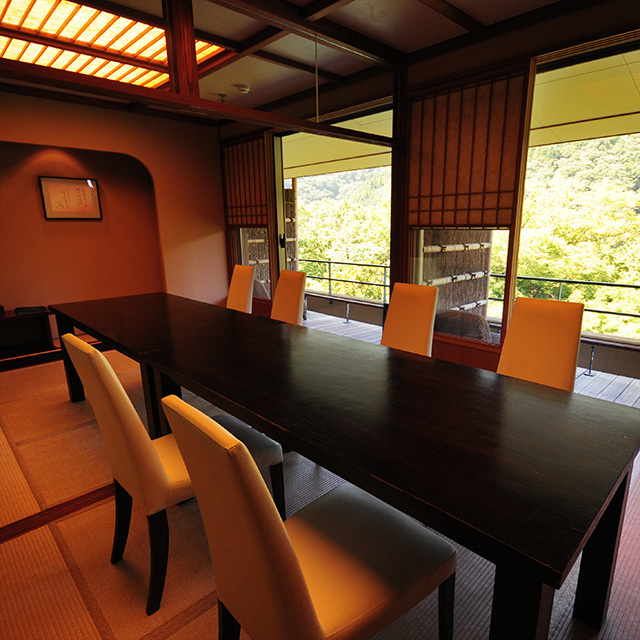 The use by the family and a small group is also possible by the Japanese-style room type. 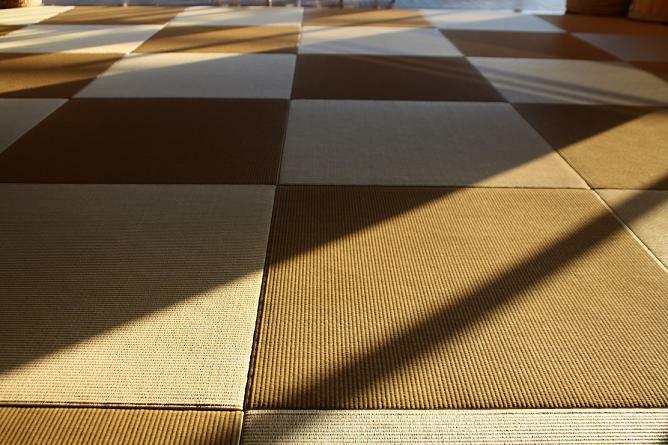 Please lie down by a Japanese-style room of a tatami-floored and relax slowly. A dining digs and is a foot warmer table with a quilt over it way, so the leg can be stretched easily. 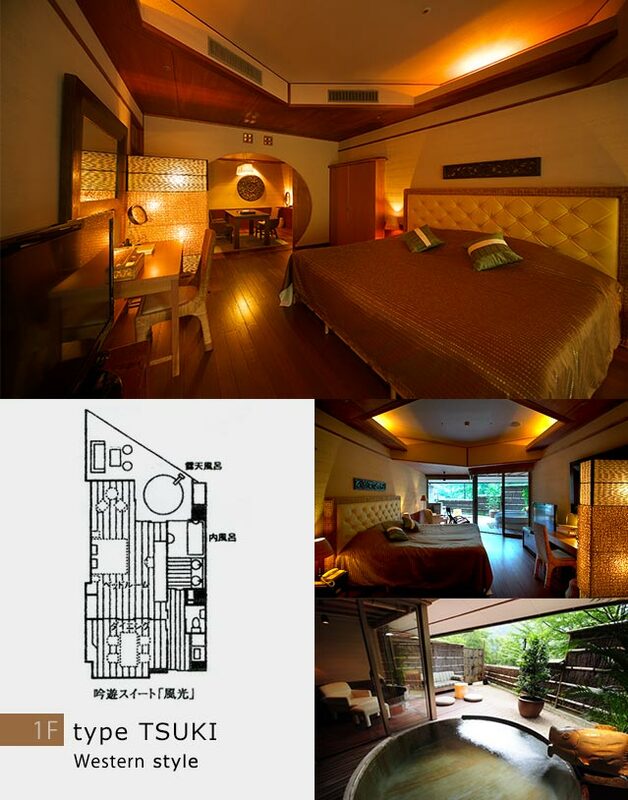 The Western-style room type is a queen-size double bed. When putting an extra bed in, the capacity is possible up to 3 people. A meal can be carried to a dining room without passing the bedroom. 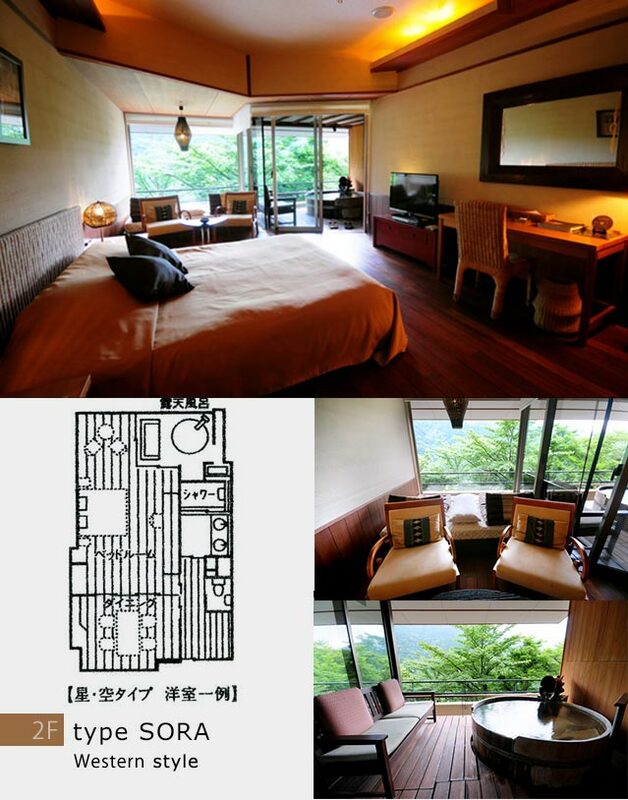 There is a「type SORA」in 2F.It's the guest room type of the most reasonable price range in Hakone ginyuu. The trees in a forest increase a branch to the neighborhood right now. The season of forest bathing, colored leaves and a wild cherry tree is very beautiful. The hot spring outdoor hotspring bath full of rustic beauty wrapped in Mori is equipped with a moon-type in a lower floor (1F) most. I also have glazed bath, reclining chair and sofa completely and loose comfortably in spite of the weather in the wide open terrace which became living room continuation. Please enjoy resort feeling fully at the luxurious space where you're in the forest. A terrace part is set up rather widely. It's a very popular guest room in the memorial day and the use when celebrating, as the suite where extraordinary resort feeling can be tasted. 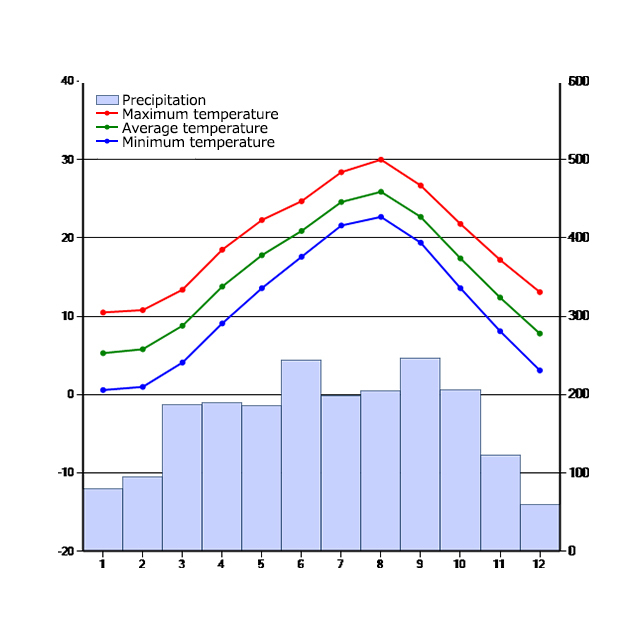 A menu of month replacement using the material examined every season is being prepared. 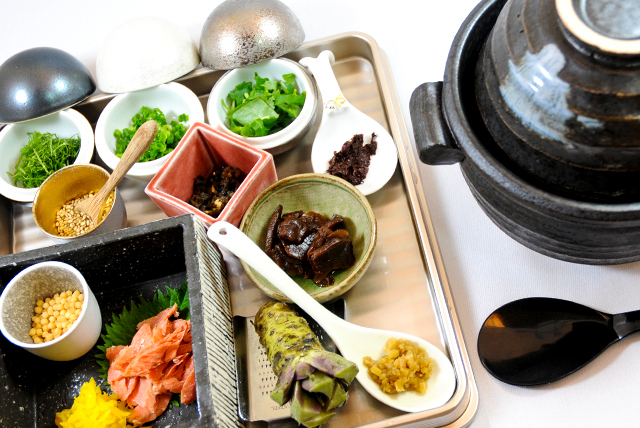 Please enjoy the best ingredients and the tea ceremony dishes with which four seasons are interwoven. 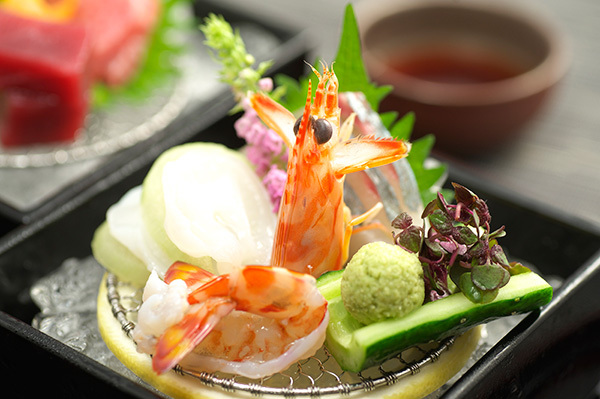 The country a producer bet on great care has a large selection of the outstanding brand ingredients including the place fish which can have just been caught, the domestic Japanese Cattle "Soshuu cow" and the Kamakura vegetables fried at Sagami-wan. 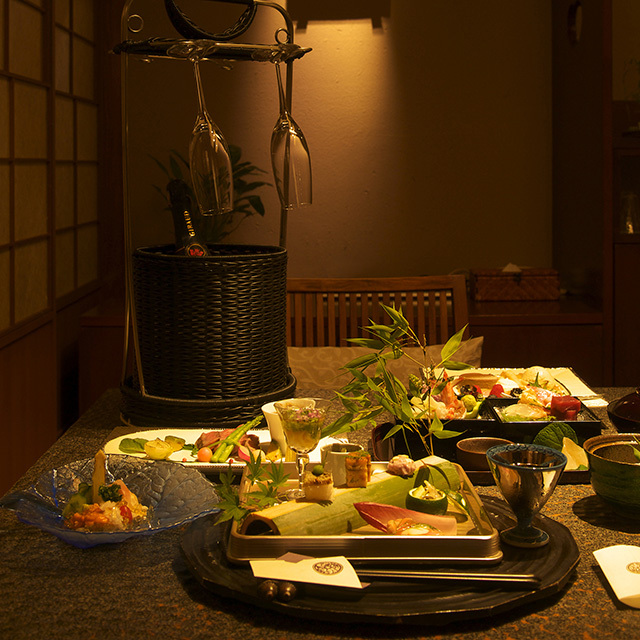 I also select sake, distilled spirits, wine and champagne carefully and have a large selection. 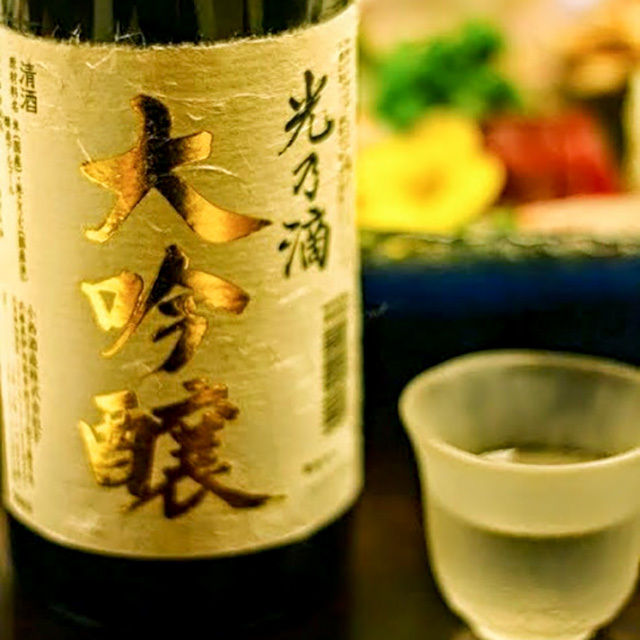 Liquor which goes well with a dish can be chosen. 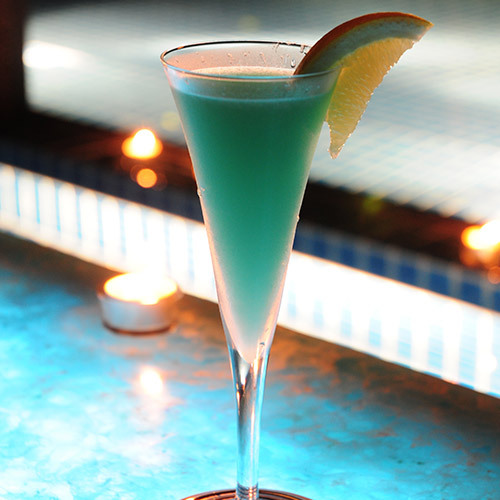 An original cocktail, the work fact is also possible at a bar. A meal is a guest room food in mornings and evenings. Without passing the bedroom to a dining room in each room, it's the make I can carry directly. Please eat a meal and a drink leisurely without hesitation for everyone. It's possible to eat the customer coming by a group together in a guest room of the wide one or an eating place of 4F "Yu hermitage". After enjoying liquor after dinner, a light midnight snack is being prepared. 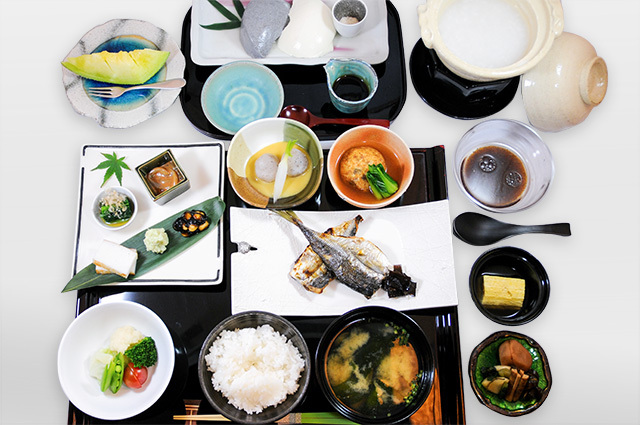 It can be chosen whether breakfast is Japanese food or Western food. By the feeling when staying overnight, an election, oh, can I have it? When staying overnight by 2 people, there are a lot of customers who order and share the type different respectively. The Japanese have loved hot spring bathing for a long time. As there are many volcanoes in Japan, there are many hot springs. Hot spring bathing makes your body relax and heals your heart. 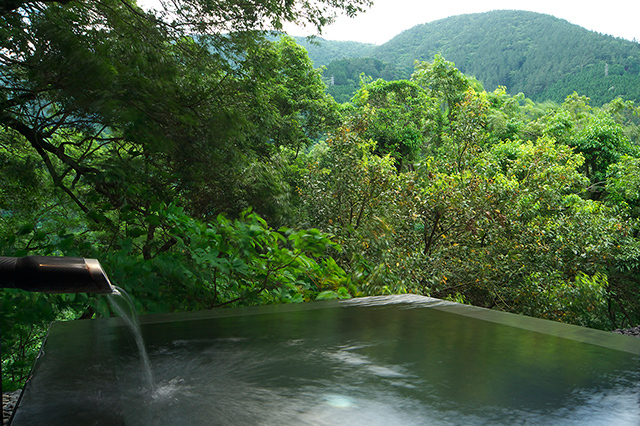 There is a "source run sink outdoor hotspring bath" of the one exclusive use of GinyuSpa use. 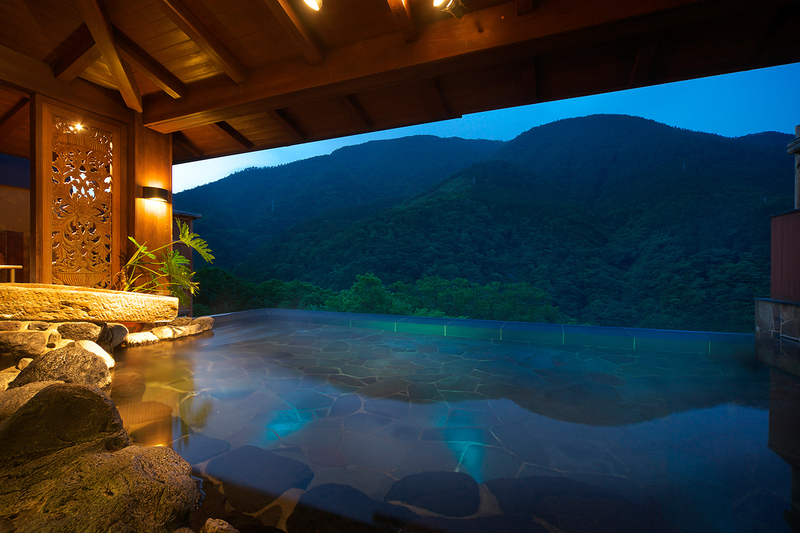 An exclusive outdoor hotspring bath was installed in the open terrace where a grand Hakone mountain range is seen. 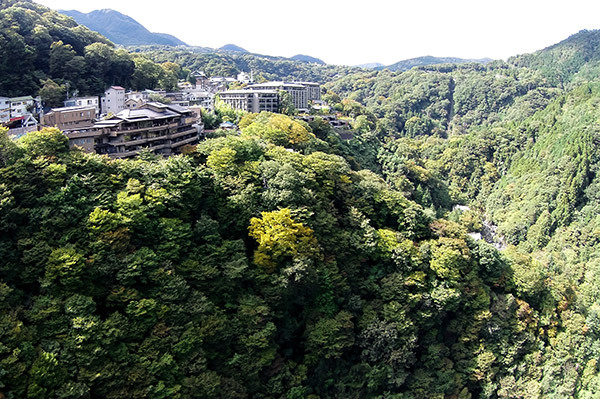 Please enjoy a superb view and a hot spring slowly. 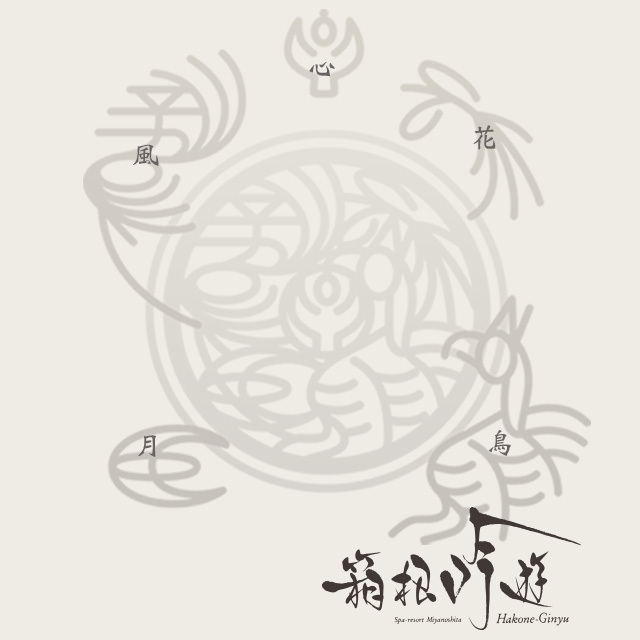 "Ginyu Spa" wrapped in air in a silent grove. 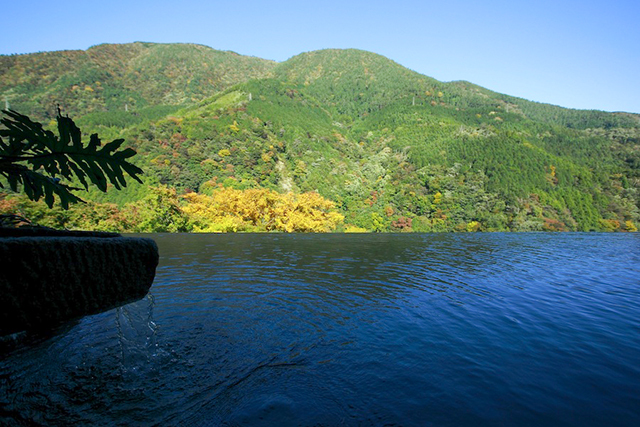 A grand Hakone mountain range is seen over the water garden. I have 1 2 single rooms and matching room in a treatment room. Private room use by privacy and the thing which receives a treatment together by a friend and a couple are possible. 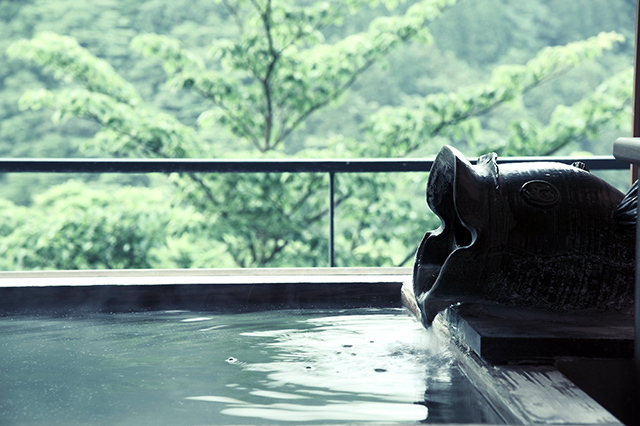 "Source run sink outdoor hotspring bath" of GinyuSpa exclusive use is juxtaposed. kon and the hot spring poured are sodium - a chloride spring. This hot-spring quality heats up a body from a core and is excellent in the keeping moist effect. All hand treatment by a therapist with the power of the cure. It's led to health and beauty. I'm also preparing a maternity treatment and the MENS aesthetics menu from anti-aging. 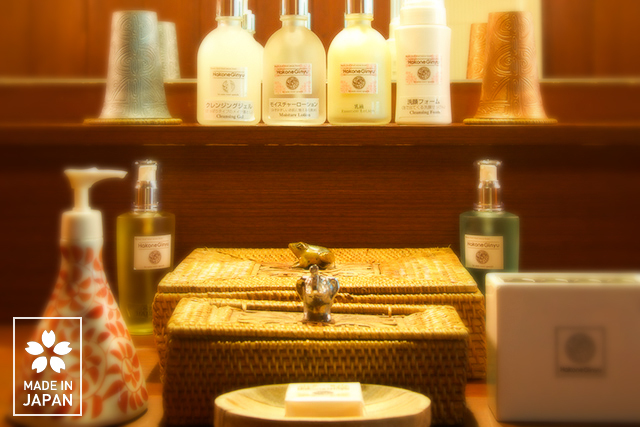 The ingredient excellent in quality is made luxurious now using a combined high-quality original product. It isn't being generally sold for small-lot production. 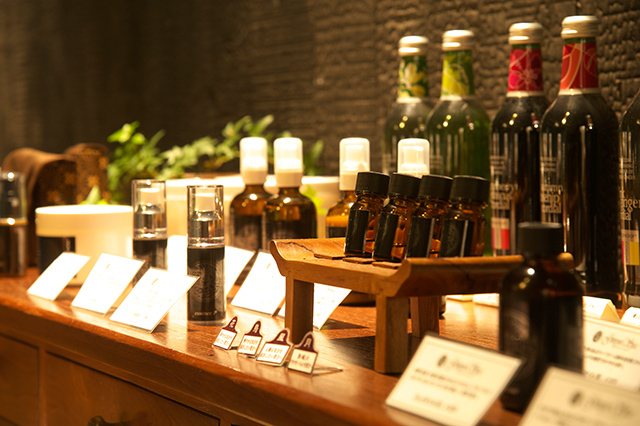 It can be bought more than a storefront and in-house online shop GinyuShop. 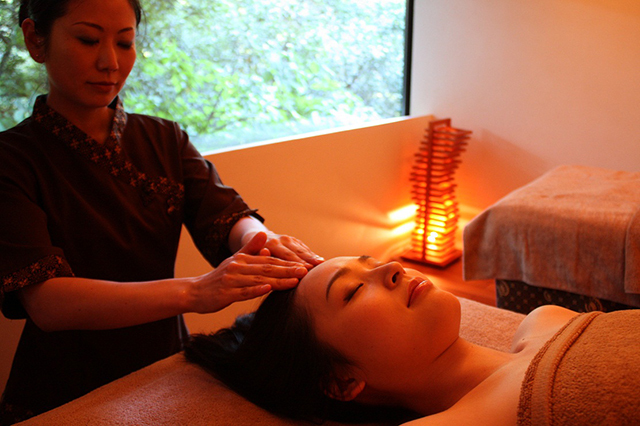 [1 set a day is limited] after aesthetics business has ended, a Spa pavilion can be reserved wholly. 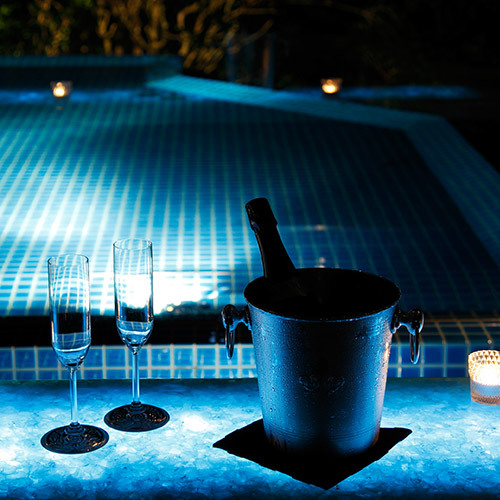 Won't you spend luxurious time with an important person in the atmosphere different from the daytime? 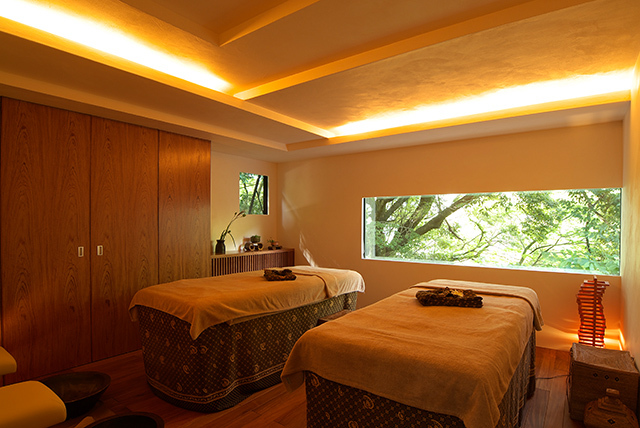 You can use a relaxation room and a source run sink bathroom in GinyuSpa. The bartender who is under exclusive contract will bring a drink. When you'd bring a CD to a song of a memory, favorite BGM can be played. When ordering champagne, a cake and a bouquet beforehand, it's possible to prepare it here. It's held at night of a new moon once in 3 months. It's announced by a mail magazine whether a schedule is Facebook. 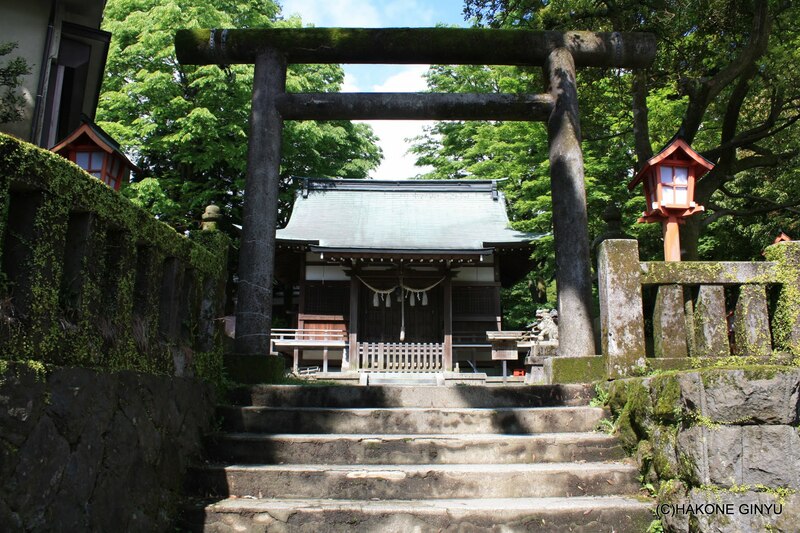 Weekly Tue・Thu・Fri｜am7:30 - 8:20 A fixed period is being held.Build as well as a flash in the sun are awaken while feeling nature in Hakone. 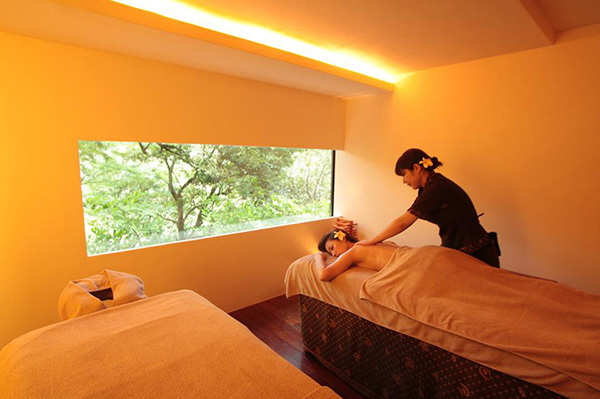 Even a set with DaySpa as well as in case of a stay can participate. 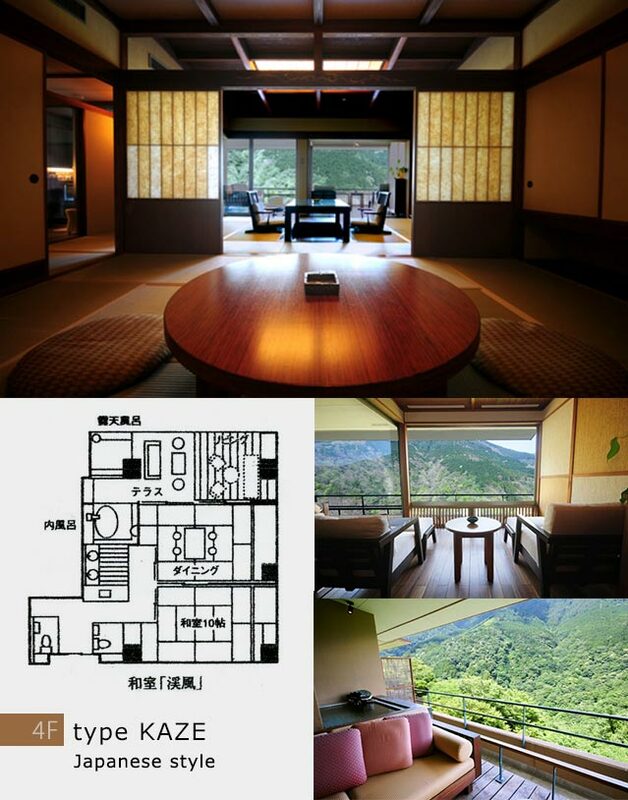 age 10～12 Kids couse Dinner and Breakfast with Futon and amenity　70% of Adult couse. 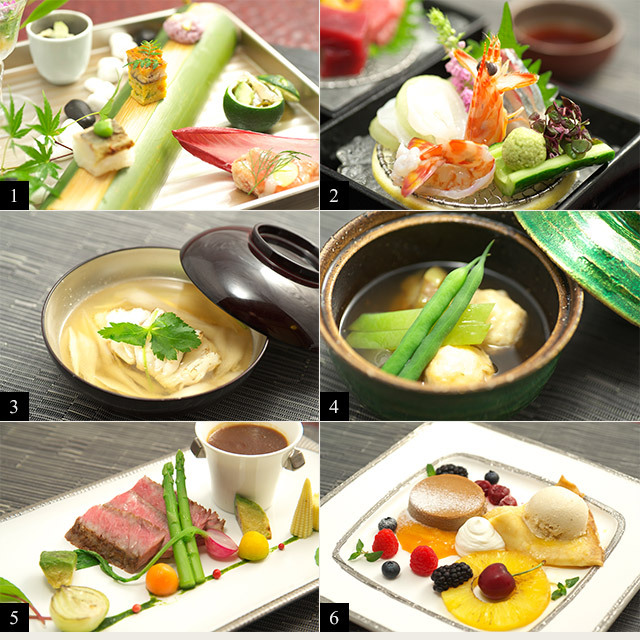 age 6～9 Kids plate Dinner and Breakfast with Futon and amenity　50% of Adult couse. 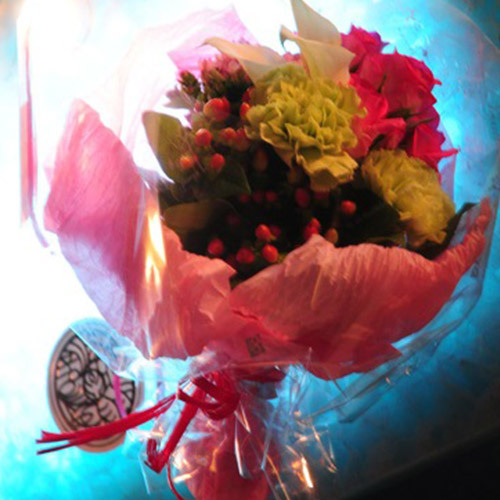 Copyright© HAKONEGINYU.CO.JP All rights reserved.